Our St. Anthony's school choir "The Antonians" sing at all of our Friday student Liturgies, and the selected first Sundays of the month during the school year for our St. Anthony's parishioners at our 9am Family Mass, which also includes a school and parish social in the Ballad Room of our cafeteria. We lead all of the schools in song in the Wilmington Diocese with Bishop Malooly every October, as we pray the Rosary for Our Lady Of Peace. 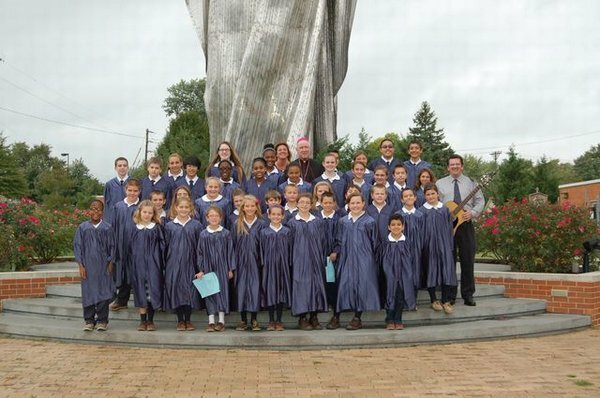 The Antonians also sing at all of our special events during the school year, which include events in our Gymnasium, as well as additional Masses at the Church. We will be singing again this year at "An Evening Of Sacred Music" which brings together the Music Ministries of many of the schools in the Diocese of Wilmington. We are proud to represent the St. Anthony Of Padua Grade School. For more information contact Mr. Colligan at 302-740-5918 and rcolligan@stanthonynet.org.